Like clockwork, it’s practically Sukkot and I have a butternut squash recipe from Aunt Sydney and my Cousin Mark for you. I know some of you served her butternut squash, leeks and grapes dish from last Sukkot every week until the marketplace ran out of squash. I hope you’ll like this butternut squash hummus recipe just as much. I first had this hummus at a brunch Aunt Sydney hosted when we were all in town for my cousin Caleb’s bar mitzvah. (You know, the weekend when I had that salted chocolate rye cookie.) 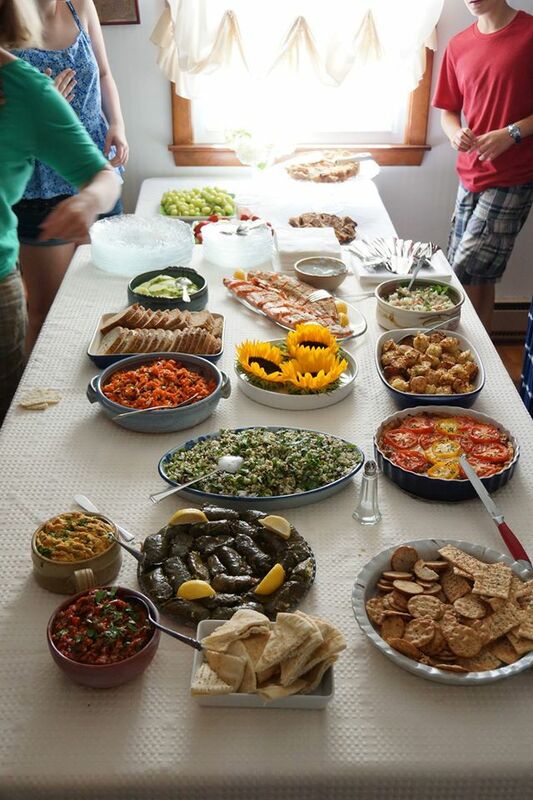 Cousin Mark snapped a photo of the brunch which might be the most beautiful photo of the most beautiful brunch that ever was: Roasted salmon, tomato tart, homemade grape leaves, rice salad, carrot salad, red pepper and eggplant caviar, this hummus. Just a magnificent spread. In addition to being an excellent photographer (and a general technology wiz), Cousin Mark is also the source of this recipe. You see, he serves as vice president of the Macular Degeneration Foundation. Macular degeneration affects the central vision and is the leading cause of legal blindness in people over 55 years old in the Western World. In the United States alone it affects ten million people. This year the foundation put together a cookbook of recipes for healthy vision. Its contributors include Lidia Bastianich, Ina Garten, Jacques Pepin and Alice Waters. So, yeah, if you were on the fence about the cookbook, it’s time to hop on over. The book is on presale now but won’t be shipped until February. I’ll be back to share more recipes from it. This recipe was a breeze to put together. I actually kicked up the oven from 350F to 450F because that’s just how I roll when I roast things. I’m using the rest of the squash tomorrow night in the butternut squash Thai curry. Because Thai food. Preheat over to 450 degrees. Toss the squash with 1 Tablespoon of olive oil, place on a baking sheet and roast until the squash is tender, about 25 minutes. Set aside to cool. In a food processor, pulse the chickpeas until coarsely chopped, then add the cooked squash, tahini, lemon juice, coriander, cumin, cilantro, garlic, hot sauce, salt and pepper; process until smooth. To serve, ladle mixture into bowls and drizzle with the remaining 2 Tablespoons of olive oil and dust with cayenne.